Sacred Hearts Academy sophomore Jenna Tanna spent part of her summer participating in John Hopkins University’s Center for Talented Youth summer program at Notre Dame of Maryland University in Baltimore, Maryland. For three weeks in June/July, Jenna attended a Whales & Estuary Systems course where students learned about the whales at StellwagenBank near Boston, Massachusetts, and compared and contrasted estuary systems along the northeast coast. During the eight-day field component, students sailed and slept aboard the LadyMaryland, a 104-foot schooner, and traveled through portions of the Chesapeake Bay, Delaware Bay, Hudson River, Long Island Sound, Narragansett Bay, Peconic Bay, and the North Atlantic Ocean. Throughout their voyage, students employed scientific equipment, such as plankton and neuston nets and video microscopes, to analyze water and marine life in these estuarine environments. The students were involved in all aspects of the Lady Maryland’s operation, including raising sail, navigating, taking the helm, and performing daily ship maintenance. During the land component, students investigated whale anatomy, physiology, adaptation, and behavior. They used DNA fingerprinting as a technique in whale identification and continued their studies in estuarine dynamics. 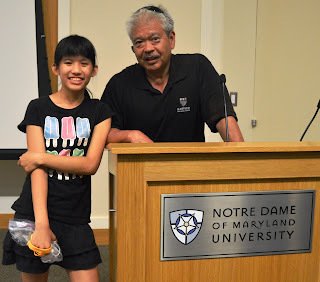 This was Jenna’s fourth year participating in Johns Hopkins University’s CTY program. Last summer, she attended a Volcanoes class at Seattle University. In 2014, she studied Zoology at Haverford College in Philadelphia, Pennsylvania. In 2013, she studied Science, Engineering and Thermodynamics at Loyola Marymount University in Los Angeles, California. At all four colleges, Jenna enjoyed interacting with other students from all over the world in a collaborative environment to strengthen her science, technology, engineering and mathematics (#STEM) skills.